Vemuri, S., et al. Dissipation Pattern of Chlorpyriphos, Cypermethrin, Ethion, Profenophos and Triazophos in Curry Leaf. (2016) Int J Food Nutr Sci 3(2): 372-377. © 2016 Vemuri, S. This is an Open access article distributed under the terms of Creative Commons Attribution 4.0 International License. Studies were conducted for determining the residues of Chlorpyriphos, Cypermethrin, Ethion, Profenophos and Triazophos in Curry leaf which were detected the most in market samples by conducting field experiments after spraying twice during 2015 - 2016 and analyzed using QuEChERS method on LC-MS/MS. As there are no MRLs for curry leaves, it should be considered as most important to fix MRLs to ensure food safety and consumer health and to create awareness among the farmers about the application dose, method of application and Pre-harvest Intervals. The mismanagement or non-availability of proper information about the pesticide application can lead to contamination of pesticide residues in curry leaf. The findings of this study provided important data on dissipation of pesticide residues in curry leaf and hence, it is essential to conduct dissipation studies in other curry leaf growing agro climatic regions, which may serve as basis for future policy about the standards and quality control of pesticides. Murraya koenigii L. (curry leaf) belonging to family Rutaceae is a leafy spice characterizing authentic Asian-Indian cuisine and it is used in small quantities for its distinct aroma as well as for preservation purposes. Curry leaf oil an volatile oil, produced from the plant has uses in the soap industry. Recent studies have shown that carbazole alkaloids have several biological activities such as anti carcinogenic effects in dimethyl hydrazine (DMH) treated rats, anti platelet activity and vaso relaxing effects. Chevalier (1996) also reported that curry leaf has medicinal value as traditionally used in Eastern Asia. Interest in greater use of curry leaf has been stimulated since its high antioxidant potency was reported and this antioxidant activity is attributed due to mahanimbine, murrayanol and mahanine from M. koenigii[5,6]. Chowdhury et al. (2001) reported that these alkaloids have antimicrobial activity against gram positive and negative bacteria, and fungi. Lee et al. (2002) noted that enrichment of phenolic compounds within the plant extract is correlated with their enhanced antioxidant activity. It is reported to have antioxidant, anti-diabetic, anti-carcinogenic, antidysenteric stimulant, hypoglycemic and anti microbial activities. Biologically active carbazole alkaloids are reported to have anti microbial properties. Curry leaves have been reported to contain tocopherol, b-carotene, lutein and alkaloids. But it is observed that curry leaves have received red alert message from the European Union, who are the major importers, where the pesticide residue limits were found much beyond the permissible levels. This created a panic among the mass as curry leaves constitute a major spice exported from India. Uncontrolled use of pesticides and non-adoption of safe waiting periods has led to pesticide accumulation in curry leaf crop. The residues being persistent in nature infiltrate crops, contaminate water, pollute complete food chain and enter our body through diet. Pesticide exposure may produce biochemical alterations in the body long before adverse clinical health effects are manifested. Curry leaf samples were analyzed for pesticide residues following the AOAC Official Method 2007.01 (QuEChERS) after validation of the method in the laboratory. The samples were collected randomly from 5 locations of the market in polythene bags. Each sample was homogenized separately with Robot Coupe Blixer and homogenized 15 ± 0.1 g sample was taken in 50 ml centrifuge tube and 30 ± 0.1 ml acetonitrile was added to sample tube. The sample was homogenized at 14000 - 15000 rpm for 2 - 3 min using Heidolph Silent Crusher. 3 ± 0.1 g sodium chloride was added to sample, mixed thoroughly by shaking gently followed by centrifugation for 3 min at 2500 - 3000 rpm to separate the organic layer. The top organic layer of about 16 ml was taken into the 50 ml centrifuge tube and added with 9 ± 0.1 g anhydrous sodium sulphate to remove the moisture content. 8 ml of extract was taken into 15 ml tube, containing 0.4 ± 0.01 g PSA sorbent (for dispersive solid phase d-SPE cleanup), 1.2 ± 0.01 g anhydrous magnesium sulphate and 0.05 g of GCB (Graphatised Carbon Black). The sample tube was vortexed for 30 sec then followed by centrifugation for 5 min at 2500 - 3000 rpm. The extract of about 1 ml (0.5 g sample) was taken for analysis on LCMS/MS under standard operational conditions (Table-1). • 500 g of curry leaf was collected randomly from each plot in polythene bags. • The samples were homogenized with Robot Coupe Blixer. • 15 ± 0.1 g of homogenized sample was taken in 50 ml centrifuge tube and 30 ± 0.1 ml acetonitrile was added. • The sample was homogenized at 14000 - 15000 rpm for 2 - 3 min using Heidolph Silent Crusher. • The samples were then added with 3 ± 0.1 g sodium chloride, mixed by shaking gently, followed by centrifugation for 3 min at 2500 - 3000 rpm to separate the organic layer. • The top organic layer of about 16 ml was taken into the 50 ml centrifuge tube and added with 9 ± 0.1 g anhydrous sodium sulphate to remove the moisture content. • 8 ml of extract was taken into 15 ml tube, containing 0.4 ± 0.01 g PSA sorbent (for dispersive solid phase d-SPE cleanup), 1.2 ± 0.01 g anhydrous magnesium sulphate and 0.03 g of GCB (Graphatize Carbon Black) to remove pigments. • The sample tube was vortexed for 30 sec then followed by centrifugation for 5 min at 2500 - 3000 rpm. • The extract of about one ml was transferred into a vial for LCMS/MS analysis under standard operational conditions. Table 1: Recovery of Profenophos at various fortification levels in Curry leaf. Linearity graph of Chlorpyriphos, Cypermethrin, Ethion, Profenophos and Triazophos is represented in Figure1. • The untreated curry leaf samples were fortified at 0.05, 0.25, and 0.50 mg/kg levels adding required quantity of Chlorpyriphos, Cypermethrin, Ethion, Profenophos and Triazophos standards. • All the fortified levels were replicated thrice. 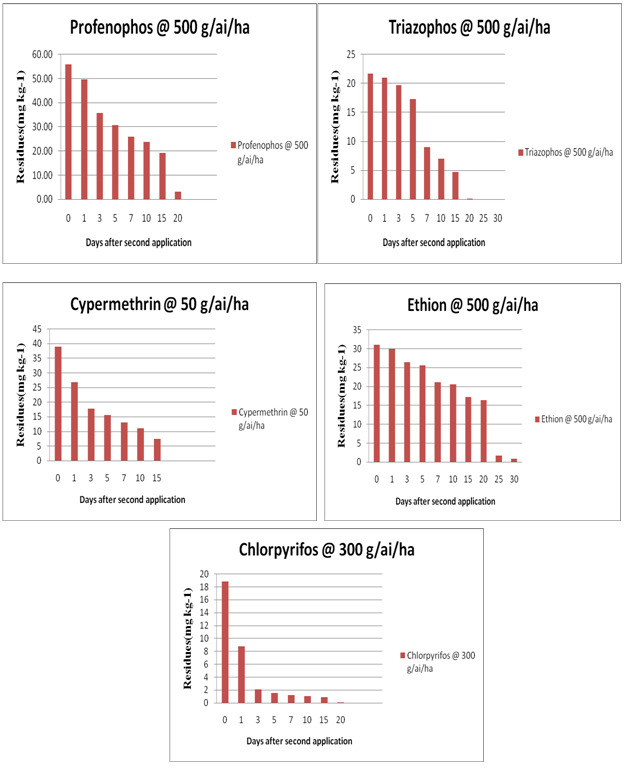 • Recoveries of Chlorpyriphos, Cypermethrin, Ethion, Profenophos and Triazophos at three fortification levels are presented in Table 2, Figure 2. Table 2: Residues and dissipation of in curry leaf. 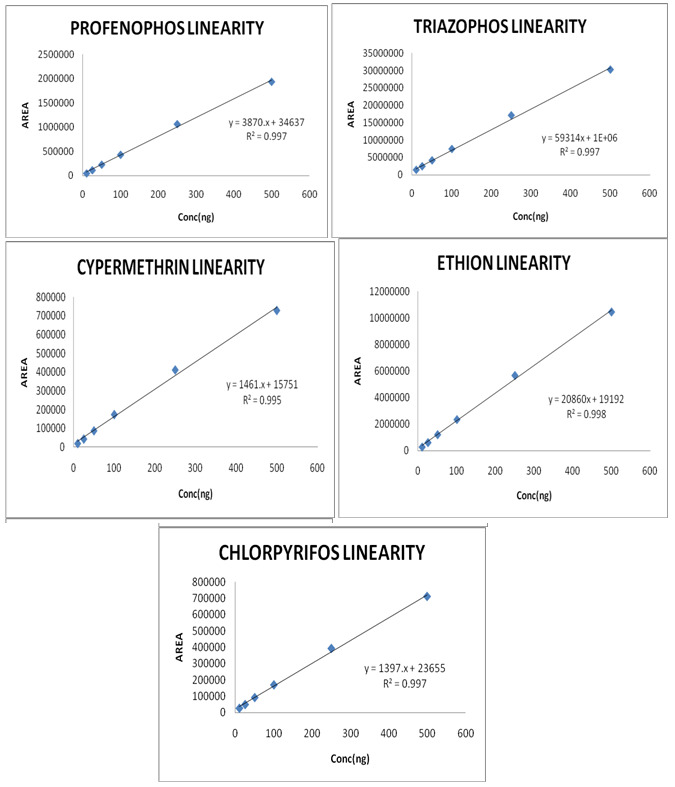 Figure 2: graph depicting dissipation kinetics of Chlorpyriphos, cypermethrin, ethion, profenophos and triazophos on/in Curry Leaf. Figure 3: Dissipation dynamics of Chlorpyriphos, cypermethrin, ethion, profenophos and triazophos in curry leaf. Certified Reference Materials (CRM) of different pesticides having purity ranging from 95.10 to 99.99 percent were stored in a freezer at low temperature, with light and moisture excluded. Solvents used in the study were all glass distilled before use. Sodium sulphate, sodium chloride and magnesium sulphate were activated in hot air oven at 450°C for 5 h. A weighed amount of analytical grade material of each pesticide was dissolved in a minimum quantity of distilled acetone and diluted with methanol to obtain a stock solution of 1000 mg kg-1. 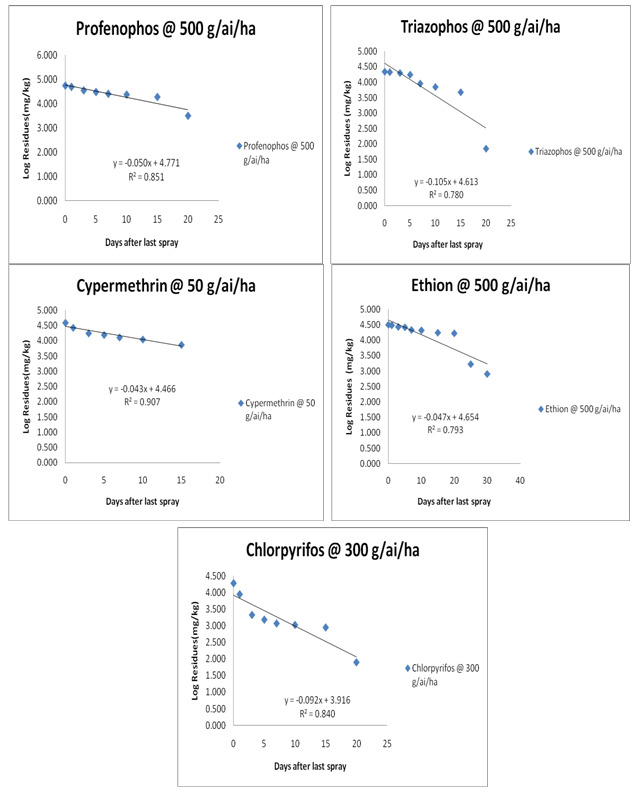 The intermediate standards and working standards of 0.5, 0.25, 0.1, 0.05, 0.025 and 0.01 mg kg-1 were prepared by suitably diluting the stock solution in methanol and used as standard check in analysis, linearity and recovery studies (Table-2) (Figure 3). • The recovery of Profenophos is 106.66% from the curry leaf samples fortified at 0.05 mg/kg, and 83.06% recovery at 0.25 mg/kg fortified level while the samples fortified with 0.50 mg/kg have shown the recovery of 98.06%. • Hence, the limit of quantitation (LOQ) is 0.05 mg/kg for Profenophos in curry leaf. • The recovery of Triazophos is 85.33% from the curry leaf samples fortified at 0.05 mg/kg, and 84.00% recovery at 0.25 mg/kg fortified level while the samples fortified with 0.50 mg/kg have shown the recovery of 97.60%. • Hence, the limit of quantitation (LOQ) is 0.05 mg/kg for Triazophos in curry leaf. • The recovery of Chlorpyrifos is 94.66% from the curry leaf samples fortified at 0.05 mg/kg, and 104.53% recovery at 0.25 mg/kg fortified level while the samples fortified with 0.50 mg/kg have shown the recovery of 115.60%. • Hence, the limit of quantitation (LOQ) is 0.05 mg/kg for Chlorpyrifos in curry leaf. • The recovery of Cypermethrin is 115.33% from the curry leaf samples fortified at 0.05 mg/kg, and 97.60 % recovery at 0.25 mg/kg fortified level while the samples fortified with 0.50 mg/kg have shown the recovery of 114.86%. • Hence, the limit of quantitation (LOQ) is 0.05 mg/kg for Cypermethrin in curry leaf. • The recovery of Ethion is 101.33% from the curry leaf samples fortified at 0.05 mg/kg, and 82.00% recovery at 0.25 mg/kg fortified level while the samples fortified with 0.50 mg/kg have shown the recovery of 101.13%. • Hence, the limit of Quantitation (LOQ) is 0.05 mg/kg for Ethion in curry leaf. It is seen from the results that the residues of all five pesticides were existing in curryleaf upto 20 days except for those of cypermethrin which dissipated to BDL by 20 days. However the residues of ethion persisted upto 30 days and reached BDL by 35 days. ( Table-2). Hence care is to be taken while recommending pesticides on curryleaf as no MRL are set and the crop has high export potential. Intensive cultivation technologies produce high infestation of crops by some pests and diseases, trigger off major losses of quality crops and initiate the use of more pesticides. The increase in frequency and magnitude of residues in the curry leaf samples could be attributed to indiscriminate and over use of pesticides by farmers despite efforts by various concerned agencies. It has been found that the farmers are neither following recommended waiting periods nor abide by good agricultural practices (GAP)[11-13]. Therefore, an effective way of educating the farmers via., training and electronic media is advised particularly in view of the export potential of the crop. It is, therefore, suggested that the curryleaf collected from the markets of Hyderabad, Telangana, India are to be consumed after proper washing and decontamination methods. Periodical monitoring studies of pesticide residues may be extended to different agro climatic regions to know actual status of contamination and to strengthen the confidence of consumer in quality of food as well as food quality control authorities for future policies. 1. Joseph, Salikutty., Peter, K. V. Curry leaf ( Murrayakoenigii ), perennial, nutritious, leafy vegetable. (2008) Economic Botany 39(1): S68-S73. 2. Khanum, Farhath., Anilakumar, K. R., Sudarshana Krishna, K. R., Viswanathan, K.R., Santhanam, K. Anticarcinogenic effects of curry leaves in dimethylhydrazine-treated rats. (2000) Plant Foods for Human Nutrition 55(4): S347–S355. 3. 3. Wu, T. S., Chan, Y. Y., Liou, M. J., Lin, F. W., Shi, L. S., Chen, K. T. Platelet aggregation inhibitor from Murraya keonigii. (1998) Phyto therapy Research 12: 380- 382. 4. Chevallier,A. The encyclopedia of medicinal plants. (1996) Dorling Kindersley London, UK. 5. Tachibana, Y., Kikuzaki, H., Lajis, N. H., Nakatani, N. Comparison of antioxidative properties of carbazole alkaloids from Murraya koenigii leaves. (2003) J. Agric. Food Chem. 51(22): S6461-S6467. 6. Ningappa, M. B., Dinesha, R., Srinivas, L. Antioxidant and free radical scavenging activities of polyphenol-enriched curry leaf (Murraya koenigii L.) extracts. (2008) Food Chem. 106(2): S720-S728. 7. Chowdhury, B. K., Jha, S., Bhattacharyya, P., Mukherjee, J. Two new carbazole alkaloids from Murraya koenigii. (2001) Indian J Chem. 40(B): S490-S494. 8. Lee, J. C., Kim, J., Kim, H. R., Jang, Y. S. Antioxidant activity of ethanol extract of the stem Of Opuntia ficus-indica var. saboten. (2002) J Agric. Food Chem. 50(22): S6490–S6496. 9. Ramsewak, R. S., Nair, M. G., Strasburg, G. M., De Witt, D. L., Nitiss, J. L. Biologically active carbazole alkaloids from Murraya koenigii. (1999) J. Agric Food Chem. 47(2): S444–S447. 10. Khan, A. D., Bhatti, M. M., Khan, F. A., Naqvi, S. T., Karam, A. Adverse effects of Pesticides Residues on Biochemical Markers in Pakistani Tobacco Farmers. (2008) Int. J. Clin. Exp. Med. 1(3): S 274-S282. 11. Bhanti, M., Shukla, G., Taneja, A. Contamination levels of organochlorine pesticide and farmers’ knowledge, perception, practices in rural India– A case study. (2004) Bull Environ. Contam. Toxicol. 73(5): S787-S793. 12. Fytianos,K., Vasilikiotis,G., Weil, L., Kavlendis, E., Laskaridis, N. Preliminary study of organochlorine compounds in milk products, human milk and vegetable. (1985) Bull Environ. Contam. Toxicol. 34: S504-S508. 13. Gupta, A., Singh, B., Parihar, N. S., Bhatnagar, A. Pesticide residues in the farm gate samples of bottle gourd, cauliflower, cabbage and fenugreek at Jaipur. (1998) Pesticide Res. J. 10(1): S86-S90.